Seattle Slew, the last living Triple Crown winner and oldest living Kentucky Derby winner, died this morning at Hill 'n' Dale Farm near Lexington. He was 28 years old and today was exactly 25 years since his victory in the Kentucky Derby on May 7, 1977. He had suffered from back problems the last two years which required two surgeries and had been moved from Three Chimneys Farm after the last surgery this spring to Hill 'n' Dale Farm. The quieter surroundings there got him away from the excitement of seeing the mares brought in to breed with the other stallions. Seattle Slew’s condition had been deteriorating over the last few days to the point he needed assistance to get up each morning. The battle was finally over Tuesday morning shortly after 9am. John Sikura, owner of Hill ‘n’ Dale, said "He died peacefully—he had just had enough. "He tried as hard as he could, but he wasn’t able to overcome. Karen and Mickey (Taylor, his owners) were right with him to the end, and everybody got to say their goodbyes. It was about as noble and sad an experience as you could imagine." 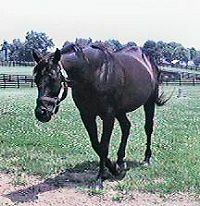 Seattle Slew will always be remembered as a great racehorse. He was the first and only undefeated Kentucky Derby and Triple Crown winner. His victories included the Champagne, Flamingo, Wood Memorial, Kentucky Derby, Preakness, Belmont, Marlboro Cup (over Affirmed), and Woodward. He retired after his four year old season with 14 wins in 17 starts and earnings of $1,208,726, winning championships in each season including Horse of the Year in 1977. Not bad for a $17,500 yearling purchase! Not only was he great on the track, but he was a champion in the breeding shed as well. He was one of the most influential sires of the past two decades and an excellent sire of sires and was standing for a fee of $150,000. He sired over 100 stakes winners including champions A.P. Indy, Slew o' Gold, Swale, Landaluce, Surfside, and Capote. His progeny have won over $76 million so far. He proved to be an excellent broodmare sire as well with his daughters producing such horses as Cigar, Lemon Drop Kid, and Escena. Seattle Slew was always a fan favorite and will be missed by many.